2Northeast Research and Extension Center Haskell Agricultural Laboratory, University of Nebraska-Lincoln, Concord, USA. Received 7 November 2010; revised 16 February 2011; accepted 7 March 2011.
requirement for these newly developed areas. micronutrient s bei n g m ore pr o no u nced . from 5.0 to 5.6 plant·m–2 when grown in clay soils . plant density ranged from 82000 to 116000 plant·ha–1. teristics in irrigated corn under sandy soil conditions. with low cation exchange capacity (Table 2). during 2008-2009 summer in El-Khattara, Egypt. 0.3 m soil depth) in El-Khattara, Sharkyia, Egypt 2008. Figure 1. Layout of one replicate showing the study factors and plant distribution in the blocks. broadcast applied at seeding around the drip lines. rate of 715 g·ha–1 for Aphids control. GY at 15.5% moist (g plant–1)/dm2 of LA. Table 3. 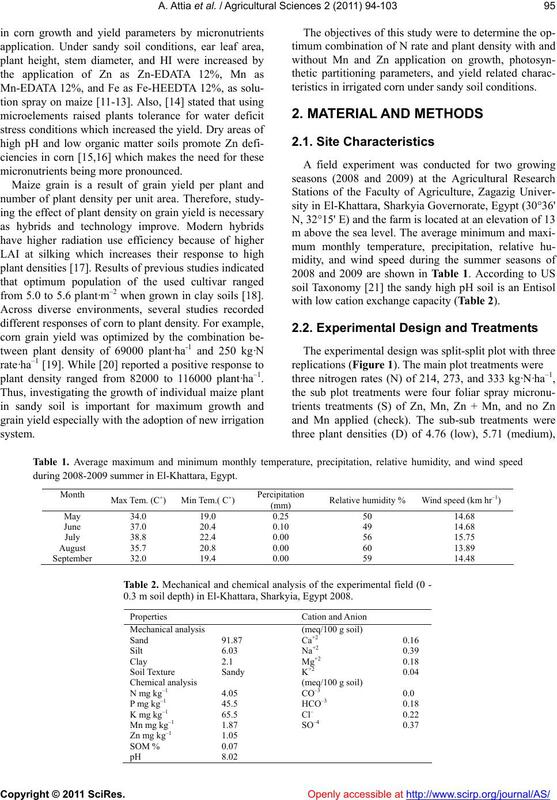 Ground water analysis in the experimental field site, El-Khattara, Sharkyia, Egypt 2008.
total dry matter partitioned into grain yield. the split factor, and plant density as the split-split factor. on plant LA and LAI observed herein. dense plants fertilized with the lowest nitrogen rate. both nitrogen and planting density effect on the variable. sprayed with Zn (Table 7). Table 4. 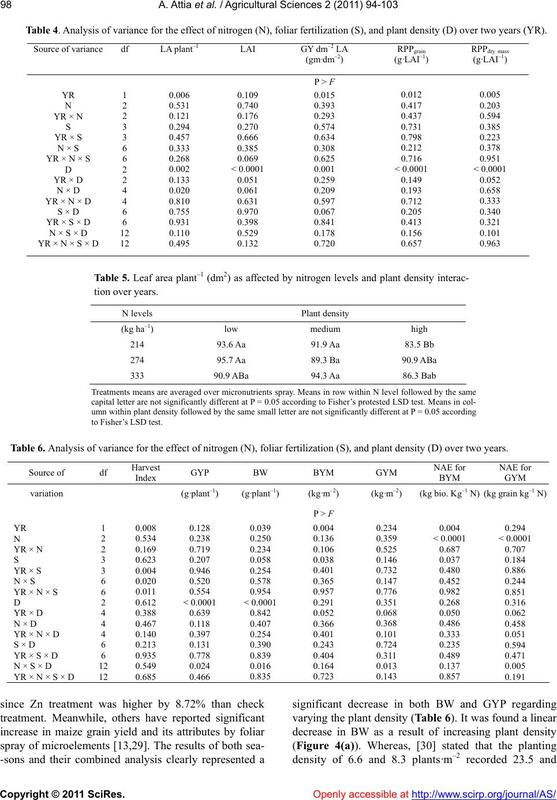 Analysis of variance for the effect of nitrogen (N), foliar fertilization (S), and plant density (D) over two years (YR). Table 6. 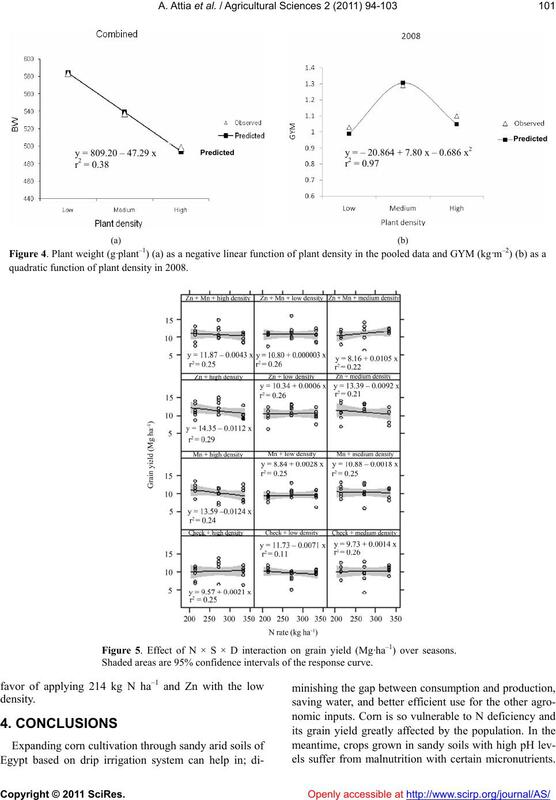 Analysis of variance for the effect of nitrogen (N), foliar fertilization (S), and plant density (D) over two years. in 2008 and 2009, respectively. Error bars represtent the standard error. raising N rate from 190 to 380 kg·ha–1 . the increased barrenness at the high planting density. high plant density in 2008 (Table 8). stant slope of the line by increasing N rate (Figure 5). 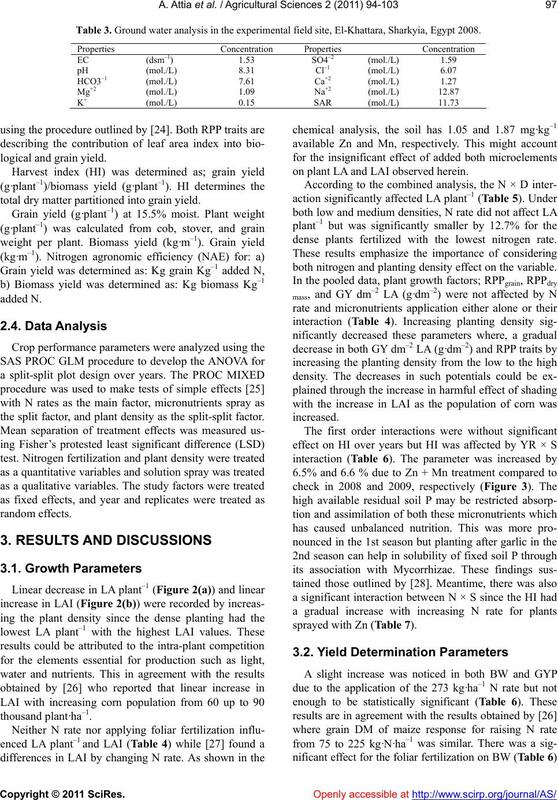 kg·ha–1 did not affect either biomass or grain yield. Table 7. Harvest index as affected by nitrogen and spray interaction in 2009.
lowed by the same letter are not significantly different at P = 0.05 according to Fisher’s protest. Table 8. 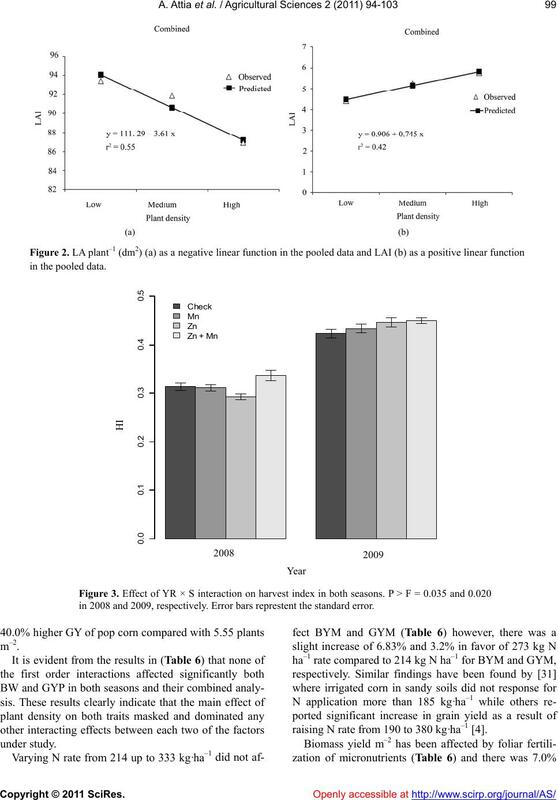 Effect of plant density on BYM and NAE for GYM in 2008 and 2009.
quadratic function of plant density in 2008. Figure 5. 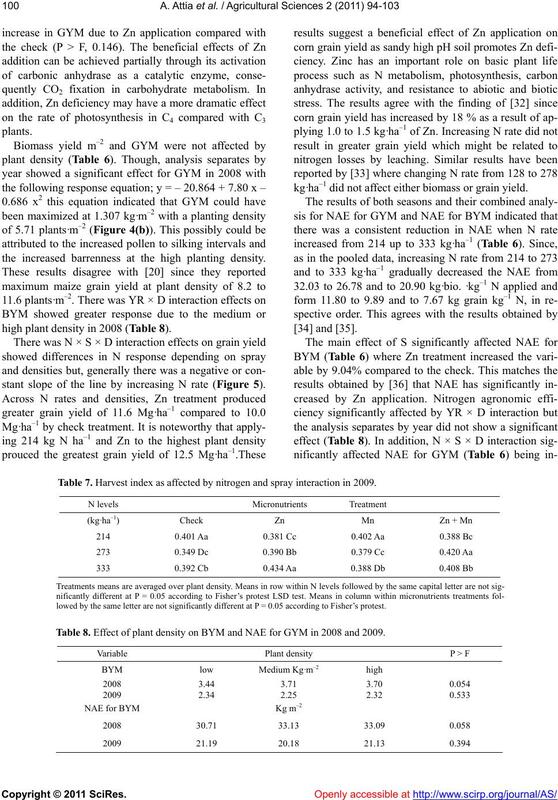 Effect of N × S × D interaction on grain yield (Mg·ha–1) over seasons. Shaded areas are 95% confidence intervals of the response curve. els suffer from malnutrition with certain micronutrients. which gradually reduced as the N rate increased. without response for the rest of the study characteristics. and grain yield under sandy so il conditions. Laboratory. 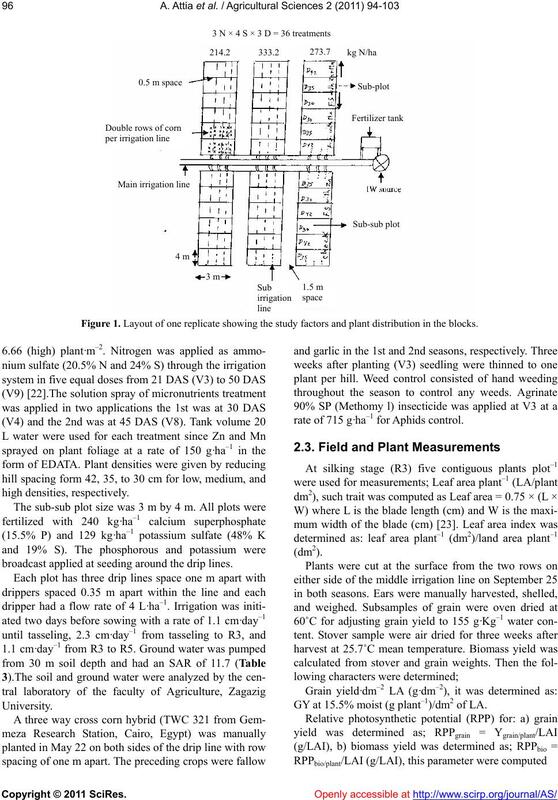 Agricultural Wa ter Managemen t, 42, 1-27.
tions in Soil Science and Plant Analysis, 29, 931-946.
trickle irrigated crops. Fert Research, 6, 235-255. El-Hendawy, S.E., Hokam, E.M. and Schmidhalter, U.
Colorado. Agronomy Journal, 98, 1367-1374.
the 4th Conference Agron, Cairo, 1, 405-417.
istry of Trace Elements. PWN, Warsaw, Poland, 398.
of Agricultural Science, Moshtohor, 31, 1811-1822.
culture and Biological Sciences, 5, 16-23. Foliar Application Under Water Deficit Stress Conditions. 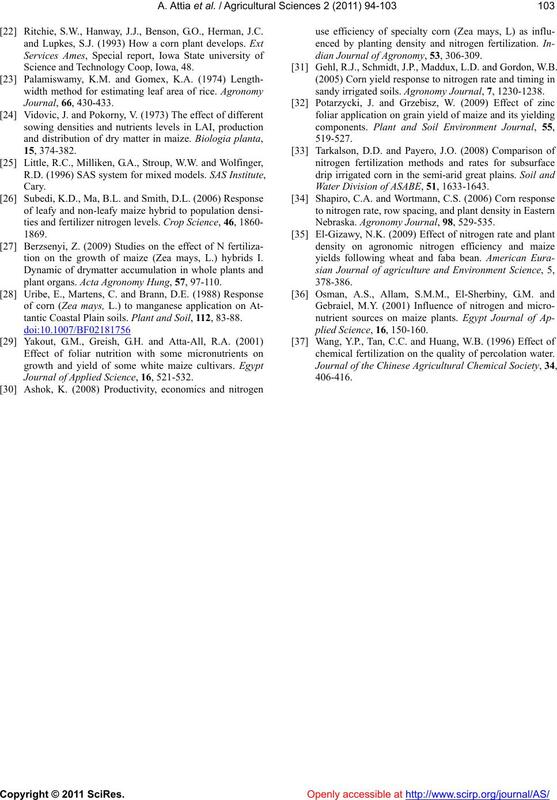 Porter, P., Hicks, D., Lueschen, W., Ford, J., Warnes, D.
 Ritchie, S.W., Hanway, J.J., Benson, G.O., Herman, J.C.
Science and Technology Coop, Iowa, 48.
tion on the growth of maize (Zea mays, L.) hybrids I.
plant organs. Acta Agr onomy Hung, 57, 97-110.
tantic Coast al Plain soils. Plant and Soil, 112, 83-88. 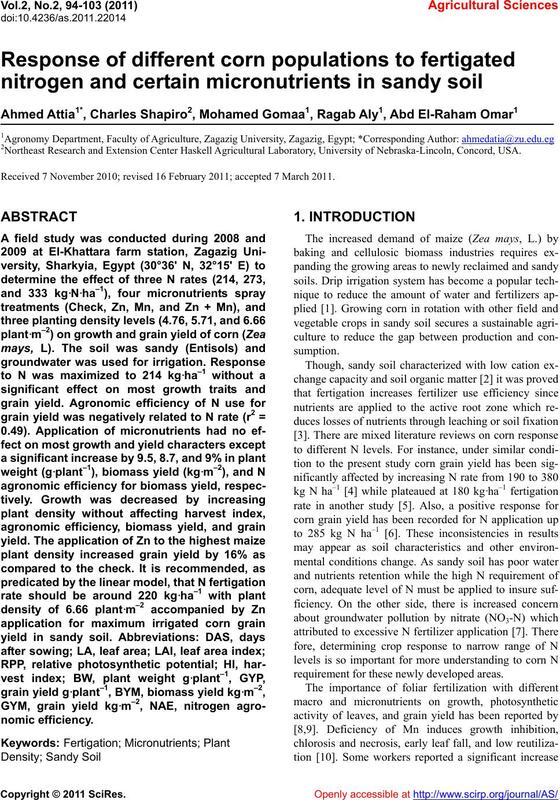 Journal of Applied Science, 16, 521-532.
dian Journal of Agronomy, 53, 306-309. Gehl, R.J., Schmidt, J.P., Maddux, L.D. and Gordon, W.B. sandy irrigated soils. Agronomy Journal, 7, 1230-1238. Water Division of ASABE, 51, 1633-1643. Nebraska. 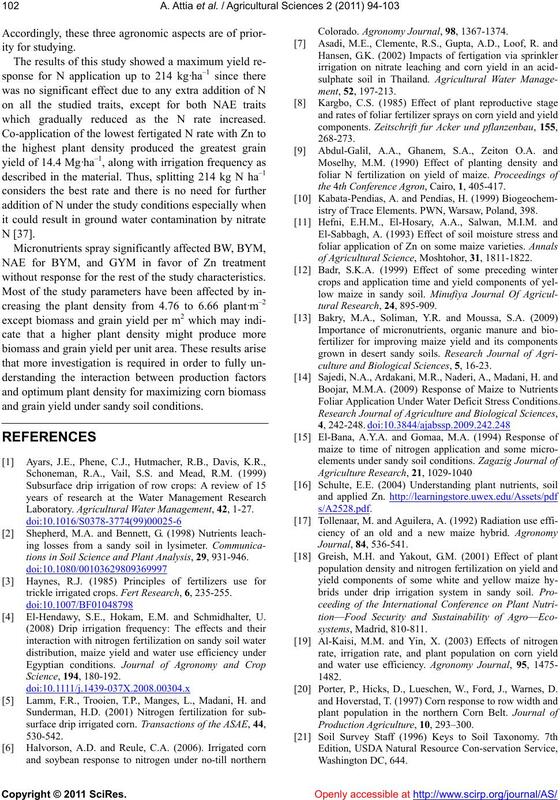 Agronomy Journal, 98, 529-535.
chemical fertilization on the quality of percolation water.